also be exciting to visit the artist’s studio and meet with them one on one. Because New Mexico’s weather is so delightful in the autumn, there are several Artist Studio Tours not far from Santa Fe. In addition to visiting with the artists in their creative space, you will also get to enjoy scenic drives through the New Mexico landscape. Located just 16 miles north of Santa Fe, the Pojoaque River Art Tour, known for its tri-cultural nature, quality, and variety of exhibitors, includes twelve studios and two artists’ markets, totaling thirty-three artists. Visitors travel through the eclectic and lovely old farming communities of Pojoaque, and Nambé, a wonderful opportunity for a bike or auto adventure on a fall weekend. Gallery artists will be hosted by Estrella Del Norte Vineyard‘s new gallery, vineyard and winery in Nambe, a perfect end point for a beautiful day. The Pecos Studio Tour is made up of a loosely knit group of artists living in and around the village of Pecos in northeastern New Mexico. 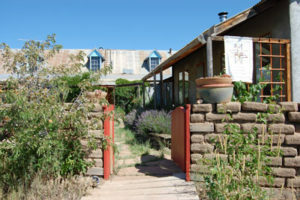 Located 20 minutes from Santa Fe, the small community hosts a blend of unique people. Besides artists in all media, many residents have long historic and cultural ties to the area. Situated on the east side of the Sangre de Cristo Mountains, Pecos enjoys four beautiful seasons. With clean air and wonderful light, it’s the perfect atmosphere for creating inventive art. This early Spanish settlement is now home to a community of artists. El Rito is located just northwest of Espanola, about 40 minutes from Santa Fe. This is an opportunity to acquire folk art such as hand carved furniture, paintings, pottery, artist’s books, textiles, santos and much more.